Welcome to the Schaumburg High School Band Program! This organization is the largest student group at SHS and has a long-standing tradition of excellence. We are excited to have you join the band and hope to answer some of your questions. Below you will find answers to incoming students' most frequently asked questions. As we get closer to the end of the school year and the beginning of summer, check back here for more information. If you have any further questions, please feel free to email Mr. Inendino at vinendino@d211.org. There are four levels of concert bands at Schaumburg High School, all of which meet for 50 minutes every day during the school day. All freshmen are members of the Cadet Band (C157 - Band 1). Sophomores, juniors, and seniors are split into 3 different levels of concert bands as determined by audition: Concert Band, Symphonic Band, and Wind Symphony. You can read more about these groups on the Concert Bands page of our website. Can I audition for one of the upperclassman bands for my freshman year? All freshmen must enroll in Cadet Band (C157 - Band 1). 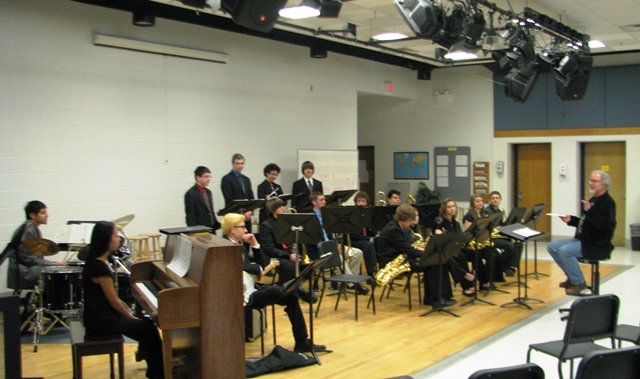 However, freshmen who play a jazz instrument may audition for our jazz program (see the Jazz Band section below). Can I participate in band as well as other activities/athletics? Yes! A large number of students in the band program are also active in other activities or athletics at SHS. As long as students are organized, manage their time effectively, and communicate scheduling issues in advance, you can participate in multiple organizations at SHS and be very successful. My former school supplied an instrument. What instruments does SHS supply? 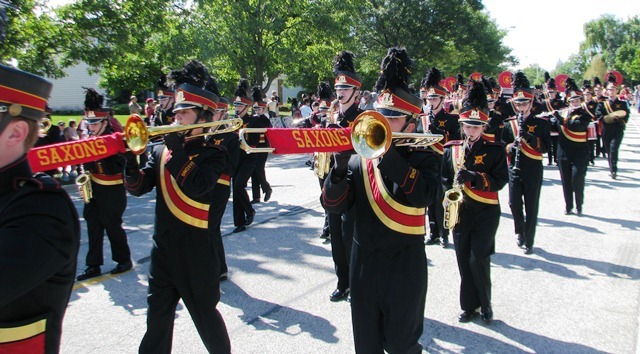 Schaumburg High School supplies the following instruments for band students: oboes, bassoons, bass clarinets, tenor saxophones, baritone saxophones, french horns, mellophones, euphoniums/baritones, tubas, sousaphones, and percussion. Students who use a school instrument are expected to supply their own mouthpieces and other supplies. Percussionists are required to each have their own stick bag with appropriate sticks and mallets. For recommendations on mouthpieces or other supplies, please contact a director. Are there additional musical opportunities for me to pursue on my instrument at SHS? Yes! First, we HIGHLY recommend that all students get involved in taking private lessons, as this is the single most effective way for students to improve on their instrument. We have a fantastic private lesson staff at SHS who are available to teach students during the school day or after school (read more about them here). As freshmen, students are also encouraged to participate in IHSA Solo and Ensemble Festival and our jazz program. Additional opportunities for sophomores through seniors include auditioning for ILMEA District 7, performing in the Pit Orchestra for the SHS Musical, and becoming a member of the Tri-M Music Honor Society. I do not plan on pursuing music as a career. Should I continue in band? Absolutely yes. Participating in music making, particularly at the high school level, can be a life-changing experience no matter what you may pursue as a career. Music making constantly engages both the logical and creative areas of one's mind, preparing students in ways that cannot be replicated in other courses. Being a member of an ensemble develops strong problem solving abilities, collaborative skills with peers, and a keen attention to detail, all of which students will use for the rest of their lives. Music education also develops a deeper appreciation and understanding of the arts and their role in our society. You can absolutely make band work in your schedule. Every year, a large number of band students also take several accelerated or AP courses. For many seniors, band may be the only non-AP course in their schedule and actually offer an opportunity to engage a different part of their mind during the day. Many of Schaumburg High School's best and brightest are members of our music department. Additionally, college admissions officers do not only look at test scores and grade point averages when making admission decisions; participation in the fine arts, especially in high school music ensembles, is a strong indicator that a student will be successful in college. Yes. On a yearly basis, band members typically travel to a college band day and a Chicago Symphony Orchestra or Lyric Opera performance. Approximately every two years, the band travels on tour - most recently, the 2017-2018 band traveled to Florida for performances at Disneyworld and at the Outback Bowl. What is "From Many, One?" Who is in the marching band? 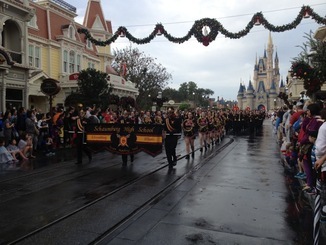 All band students (freshmen through seniors) are members of the Saxon Marching Band. Where does the marching band perform? The marching band performs at 4-5 home football games, the Schaumburg Septemberfest Parade, NIU Band Day, and playoff football games every year. 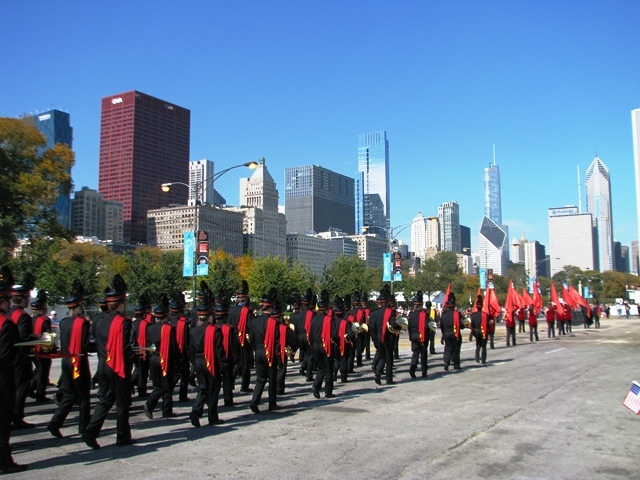 While not on a yearly basis, the marching band has performed in other events in the past, including the Chicago Columbus Day Parade, on the sidelines of the Chicago Marathon, and other local parades. The marching band is also a primary performing group when the band goes on tour. Can I participate in a fall sport and band/marching band? Yes. We have several students who participate in a sport and the marching band. Scheduling conflicts are minimal. What are the summer commitments for marching band? There are two types of summer commitments for the marching band: sectionals and band camp. Sectionals will be held Monday and Wednesday afternoons following July 4th (1-4pm). During these times, we will focus on learning music and marching fundamentals that will be needed throughout the marching band season. Attendance at every sectional is HIGHLY recommended (students should be at sectionals when they are in town - if you are out of town and need to miss a sectional, that is fine). Band Camp will be held July 29th through August 2nd (9am-6pm). During band camp, students will learn their drill on the football field for pre-game and halftime, as well as practice parade marching. Attendance at band camp is REQUIRED for all members. Due to the times we rehearse during band camp, scheduling conflicts with SHS athletics are minimal; any conflicts with SHS athletics will be worked out on an individual basis. The SHS Pep Band is our band in the stands for home basketball games during the winter. The band plays at approximately 10 home basketball games a year, all on Friday or Saturday nights. All band students are members of the pep band. 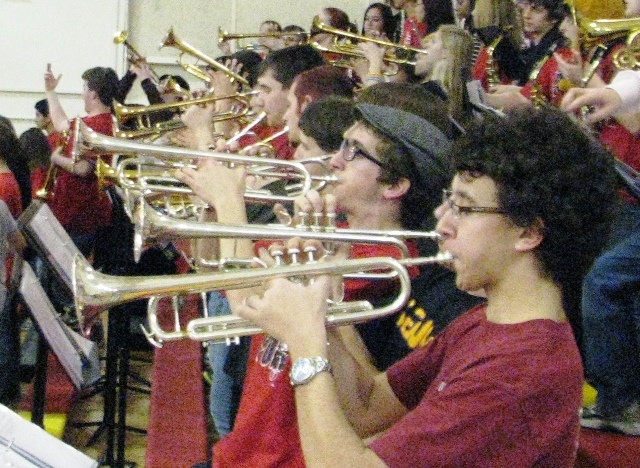 Unlike marching band, where students must attend every game, students must attend a minimum of only 4 games during the pep band season (although most students attend many more than 4). Can I be involved in jazz at SHS? Yes! 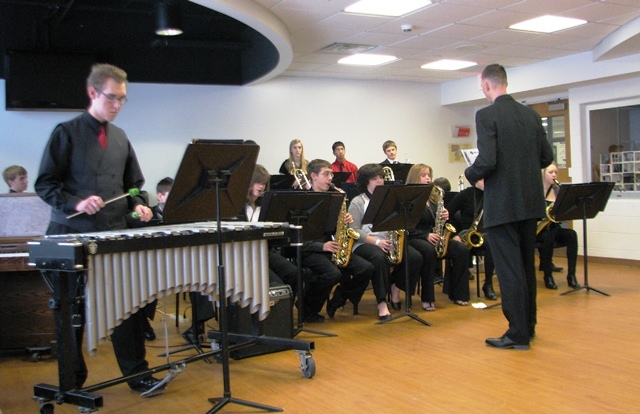 Our jazz program consists of two jazz big bands and one small group combo. All band students who play a traditional jazz instrument are welcome to audition. Audition materials will be available in late May (auditions are held in September). Can I audition for the SHS Jazz Bands if I was not in the District 54 Jazz Band? Yes. Auditions are open to any student in a Schaumburg High School music ensemble who plays a jazz instrument. When do the jazz bands rehearse? All of our jazz groups rehearse outside the school day. Typically, the two big bands meet after school or in the evening for a two-hour rehearsal once per week and a one-hour student-run sectional once per week. Have another question? Email Mr. Inendino at vinendino@d211.org.